That’s a freaking long title. But don’t let that stop you from making these cupcakes. They were divinely delicious. One of my best friends was coming to town to visit, and not-so-subtly hinted there had better be cupcakes waiting for her when she got here. I knew I had to deliver something good. One of my good friend/coworkers, Jamie, is a cupcake connoisseur (see examples here and here) had told me a while back about a cupcake cookbook she had found called Perfect Cupcakes, where all the recipes were for a batch of 6 cupcakes! Luckily she recently got a NEW cupcake book, Hello Cupcake!, to obsess over, so I didn’t think she’d mind if I borrowed the small batch cookbook. I knew that Kalena & I surely didn’t need a dozen and a half cupcakes sitting around, so only making a few would work much better. One thing my friends know about me is I can be very indecisive, especially when it comes to food, and I always aim to please. So, like I did with Katie, I gave Kalena a list of eight or so options, and she narrowed it down to just a handful for me to decide on. I settled on the Vanilla Sour Cream, because it was one of the flavors Jamie had made and shared with me, so I already knew it was yummy. 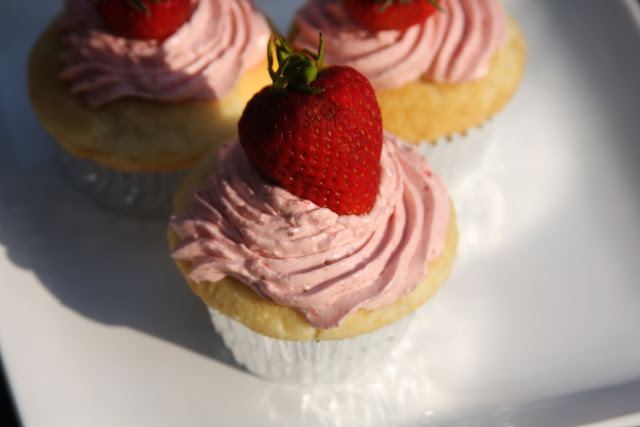 I also knew I had a 1/2 pint or so of strawberries I needed to use, and I really wanted to make a meringue buttercream. That has quickly became one of my favorite frostings. It’s incredibly smooth, and not overly sweet like buttercreams made with powdered sugar. I twittered at Clara asking if she had one, and she pointed me in the direction of (who else) Martha Stewart. I swear, Martha has YET to fail me. It’s amazing. I was even pretty scared about making this, because I quartered the recipe, to reduce it down to 1 egg. I wasn’t sure if I’d get the measurements right, and this method was different than me previous experiences with meringue buttercreams (here and here). But sure enough, just like magic, once all the butter was added, the consistency quickly became exactly what it should be. Smooth and creamy! Then I was worried again about adding my strawberry puree, but I stirred it in, then beat it a little more, and still perfect. Martha & Meringue Buttercreams, I *heart* you both. Preheat the oven to 350 degrees. Line muffin pan with liners. In a small bowl, whisk together the flour, baking powder, and salt. In a medium bowl, using a hand held mixer on medium speed, beat together the butter and sugar until light. Beat in the egg and vanilla until well blended. Gradually beat half of the dry ingredients into the butter mixture, then half of the sour cream; repeat with remaining dry ingredients and sour cream. Divide the batter evenly among the prepared muffin cups. Bake until the tops spring back when lightly topped, 20-25 minutes. Cool on a wire rack for 10 minutes, then remove from pan and cool completely on the rack. In the heatproof bowl of an electric mixer set over a saucepan of simmering water, combine egg white and sugar. Cook, whisking constantly, until sugar has dissolved and mixture is warm to the touch (about 160 degrees). Switch to the paddle attachment. With mixer on medium-low speed, add butter several tablespoons at a time, beating well after each addition. (If frosting appears to separate after all the butter has been added, beat on medium-high speed until smooth again, 3 to 5 minutes more.) Beat in vanilla. Beat on lowest speed to eliminate any air bubbles, about 2 minutes. Stir in strawberry puree with a rubber spatula until frosting is smooth. Beat again if necessary. *I did all of this using my hand held mixer, as it wasn't quite enough volume to work correctly in my stand mixer. Meringue Buttercream is the best!!! Thanks for sharing these with me too!!! That cupcake cookbook sounds interesting. Hope you had a Happy & safe 4th! Oh yum, these look so good! I love anything with strawberry, especially in the summer. Think I am going to have to try these! They look so good and I love anything strawberry! Also, Avery has already picked out all the cookies she wants to make out of the cookie book. Thanks so much! We are going to have so much fun making cookies together! I love baked goods with sour cream in them – makes everything so moist! Oh man. I'm drooling. No really. I am. I'm so glad the strawberry SMBC worked out for you! MS hasn't failed me yet. Definitely gonna keep that recipe on my must-try list on your rec. And look at you with your bad DSLR skillz! Pictures are looking fabulous. I don't bake as often as I'd like because I don't want to have tons of sweets around, so a 6 cupcake recipe would be perfect. I'm going to have to look for that book, because those cupcakes look amazing! Erin! I FOUND it! Yup, I found the cupcake book. I only bought one copy but they had several and should be able to pick up another for you. Lemme know! Oh, goodness! I’m very excited to try these! And maybe it’s a sign too – I’ve been toying with the idea of going back to being vegetarian. 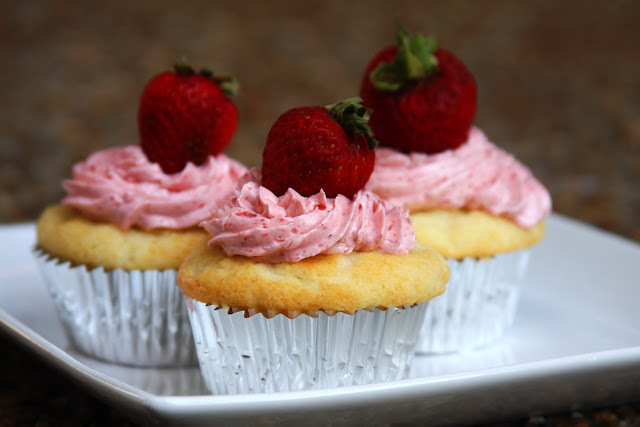 I think strawberry cupcakes might have just convinced me! Thanks for sharing! Thanks so much for this recipe! I just made them and they were very good. The frosty was very tasty with the fresh strawberries. The cake was a little too dense for me but it tasted great. Maybe a lemon cake with that frosting would taste good too!